This flight of stone steps was built on "Misaka" hill, the front approach to the 1200-year-old Daionkyo-ji Shakain Temple, which is known as Koyasan Temple in the west. 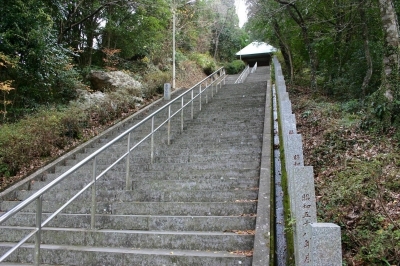 The construction of the stone steps started in January, 1980　and in November 1985 this flight of steps had the most stone steps in Japan, beating the 2446 stone steps at Haguro-san in Yamagata Prefecture. In the end of March, 1988 after 9 years of construction, the stone steps were completed with 3333 steps! 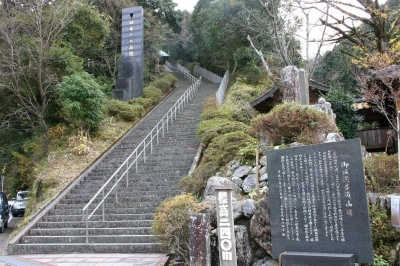 The stones used for the steps are from as many as 10 different places, such as Aji stone in Kagawa Prefecture, Okazaki stone in Aichi Prefecture, Oshima stone from Ehime Prefecture, Inada stone in Ibaraki Prefecture. The steps are also made of stones from 7 foreign countries such as China, Korea, and Brazil. These stones are the symbol of good and friendly relationship with these countries. 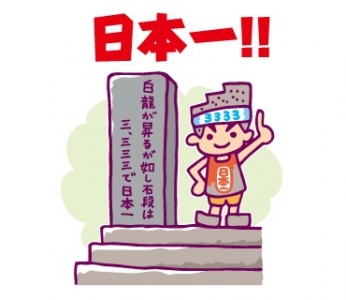 There are some rest areas called "Ichi no Koshi (first reat area)" and "Ni no Koshi (second rest area)"on the way to the top. it is said that they are the spots where a noted priest called Shozen Taishi took a rest when he founded the Shakain here. The beauties of nature are also something to see, cherry blossoms and azaleas in spring and beautiful foliage in fall. Please enjoy the 3333 steps, taking breaks at the Koshis (rest area) and seeing beautiful nature along the way. From 2000 steps and up, there will be great views of Ariake Sea and Mt. Unzen Fugendake. There are lots of rhododendrons along the wayside planted by local people, which will relieve your exhaustion from the exercise. To Yatsushiro by Kyushu Sanko Bus, change bus at Matsubase to Tomochi. Change bus at Samata Miyanomae Bus Stop to Aso Kotsu Bus. Note: 20 minutes from Kyushu Expressway Matsubase IC or Mifune IC. 50 minutes from Kumamoto City Downtown.